Evergreen perennial, with very.....very dark, almost black, glossy leaves and spikes of pink-tinged white flowers in the late spring and early summer. 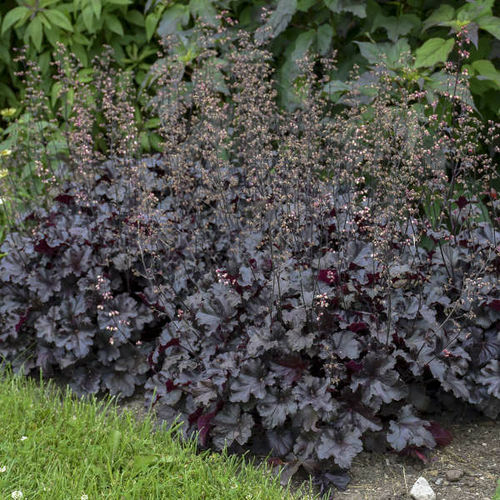 This is probably the blackest of the black Heucheras. This variety has a very dense habit and is a great foil for other colour combinations. Very easy to grow and superb in containers as well as the border. Give it a fertile soil in sun or semi-shade. Don't plant too deeply, the crowns must be kept uncovered. Planting suggestions: Great with any fern, the almost black foliage brings out other colours, especially green. For spring interest try adding some spring flowering bulbs, yellows are particularly striking so try Narcissus Tête à Tête.